MediBalls were engineered to be longer lasting, easier to see, and easier to handle than any other type of medicine ball. They can be used indoors, outdoors, and even in the pool. Dozens of general and sport-specific exercises can be performed with medicine balls, and they are as much fun to use as they are versatile. Medicine ball training can form the core of a general strength training program, can be used to improve ball handling or other sports skills, and can be used for the rehabilitation of physical injuries. Medicine ball training is a fun alternative for those people who get bored with conventional weight training. Medicine balls help develop functional strength (i.e. strength with movement and balance), and are versatile enough to use anywhere that you have a small amount of open space. While there are other types of medicine balls on the market (including those made of stitched leather or molded rubber), none are as easy to handle as Mediballs. MediBalls always return to their perfectly round shape, but their compliant surface flexes on impact, which greatly reduces the incidence of jammed fingers. MediBalls are also built to last, and are more economically priced than most other medicine balls. Medicine balls were first used more than a century ago, and were traditionally made of a stitched leather cover, surrounding a well-padded metal or sand-weighted core. This type of medicine ball is still made today, and most are considerably larger than a basketball. Due to the way that these "old fashioned" balls are constructed, they are always out-of-round and unbalanced. This, combined with their large size, makes them difficult for most people to handle. Because of the materials used to construct these balls, they are also some of the most expensive medicine balls made, with larger sizes often priced well over $100 each. Despite their high price, though, leather medicine balls aren't especially durable. They should be kept away from water, and sometimes come unstitched. The first improvement on the traditional medicine ball was to make it with a synthetic cover. You can find this type of medicine ball in many sporting goods stores. Most balls of this type are now made in China. Lower material and labor costs have made these balls much more affordable than the original leather ones, but that's their only improvement. This type of medicine ball is still as difficult to handle, and is even less durable than the original leather ones. A more recent improvement on the medicine ball is to mold it from solid rubber. This style of medicine ball is well balanced and considerably more durable and weather-resistant than the previous versions. The biggest drawback to this type of ball is that it's surface is hard and unforgiving. Playing catch with a rubber medicine ball is only slightly safer than playing catch with a bowling ball! Gel-filled medicine balls combine a tuff but flexible outer shell with a semi-liquid gel center. This type of medicine ball provides the most benefits for all types of training. Their compact and perfectly balanced shape makes them easier to handle, their seamless construction is completely waterproof, and their flexible, forgiving surface helps prevent jammed fingers. MediBall originated the gel-filled medicine ball more than 15 years ago, and manufactures six different sizes, ranging from 2 lbs to 15 lbs. Each ball's weight is permanently molded into its surface, and its alert red color makes them especially easy to see during high-speed drills. The best way to learn medicine ball exercises is simply to experiment with them on your own. If you are new to medicine ball training, and don't have a coach to help you, we suggest that you purchase a good medicine ball training book. Our favorite is "Plyometric Exercises with the Medicine Ball", by Donald Chu. This classic instructional book is light on text, but includes scores of simply illustrated example exercises. It's an excellent reference from which to experiment with medicine ball training. Medicine ball training involves many different throwing and catching exercises, and most of these exercises require you to have a training partner. Interaction with a training partner is also what helps make medicine ball training so fun. When a human training partner isn't available, MediBall's Adjustable Angle Rebounder is a great stand in. This heavy-duty pitchback is built just like a high-quality trampoline. It fires even the largest MediBalls right back to you, at the same velocity that they were thrown. 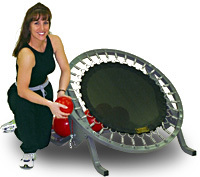 The MediBall Rebounder is even better than a human training partner for certain exercises. For example, its quick response makes it possible to do close-proximity, high-speed push pass drills. You can also do ball dribbling drills with the Rebounder surface locked in its horizontal position, or you can perform high-repetition throwing ab crunches with its surface in a steeply inclined position. The MediBall Rebounder easily adjusts to ten different positions. Its sleek steel frame is powder coated for lasting durability, and includes an integral ball rack, which stores a complete set of MediBalls. It works well on any floor that has either a hard surface or low-pile carpeting. Warning: The MediBall Rebounder is designed for use with MediBall brand medicine balls. Many other brands of medicine balls are not be as round, and can return from the Rebounder's surface at unpredictable angles. Better Fitness Products no longer stocks MediBall products, but they can be purchased from Topaz Medical.